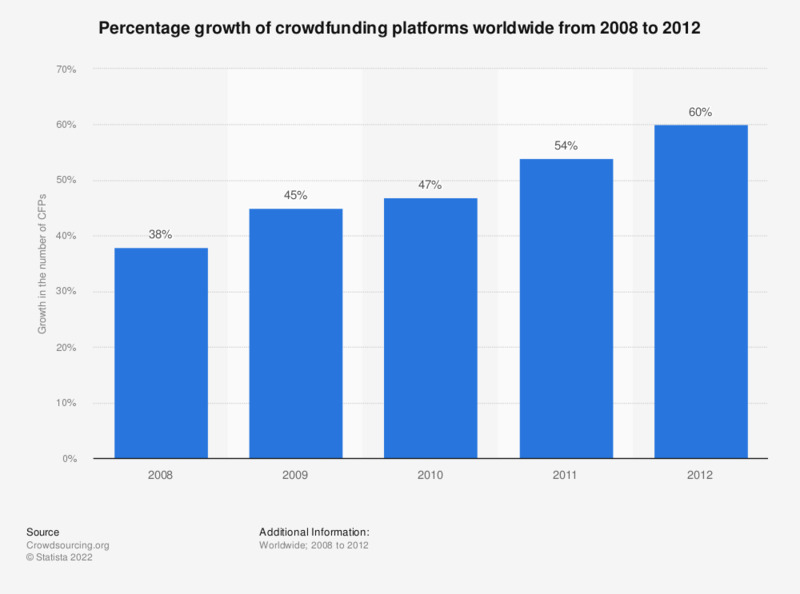 The statistic shows the percentage growth in the number of crowdfunding platforms worldwide from 2008 to 2012. In 2008, the number of crowdfunding platforms worldwide increased by 38 percent in comparison to the previous year. The rate of crowdfunding platform growth continued in all of the following years and the growth rate reached 60 percent in 2012. The total number of crowdfunding platforms worldwide as of April 2012 amounted to 342, the estimated number by the end of December 2012 was at 536. Crowdfunding or crowd sourcing is the collective effort of a number of individuals who pool together resources, usually online, in order to support the efforts of individuals or organizations wishing to get their project off the ground. After the launch of ArtistShare, the site that is often billed as being the first crowdfunding site, the growth in the number of platforms has been constant. The trends began to show in the United States towards the mid-2000s and then in Europe. The increase in the funding volume increases over the past few years are a clear sign of the developing prevalence of this method and raises some interesting questions over the true extent of its potential. In the world after the 2008 economic crisis, a world of fragile and uncertain growth and austerity, it has been proven that it is often extremely difficult for small and medium-sized businesses to procure capital loans from banks. This driver of economic growth is, at least to some extent, being helped along by those who support crowdfunding campaigns online. What is the primary reason for the acquisitions you intend to initiate in 2016?